Description: Starting at the upper parking area at Moreau State Park, this route will take us south on Old Saratoga rd. We will wind our way to Wilton Wildlife Preserve for lunch, then a scenic return along the back roads of Saratoga County to our start. Approx 28 miles....some moderate hills, but mostly level. 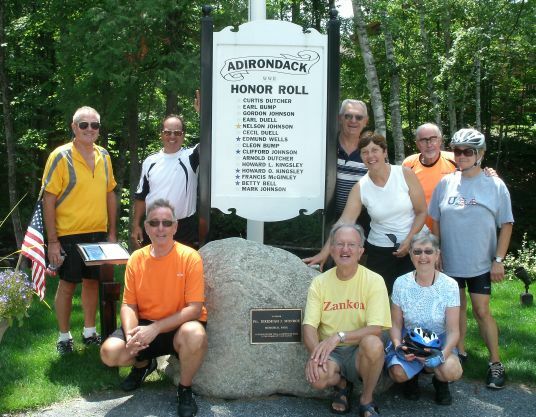 This is a pretty ride through Wilton and Moreau covering some of the same ground as Dave's Crazy 8 route, but in the opposite direction, with some new roads added. .
starting point: From I87 take Exit 17S. Head south on Rt 9, and within a few hundred feet bear right onto Old Saratoga Rd. Proceed about 3/4 miles. The park entrance will be on your right. Flash your white hair at the ticket window (New York State resident 62 or older get free vehicle entry on non-holiday weekdays) and use the parking area immediately on the right. Starting at the upper parking area at Moreau State Park, this route will take us south on Old Saratoga rd. We will wind our way to Wilton Wildlife Preserve for lunch, then a scenic return along the back roads of Saratoga County to our start. Approx 28 miles....some moderate hills, but mostly level. This is a pretty ride through Wilton and Moreau covering some of the same ground as Dave's Crazy 8 route, but in the opposite direction, with some new roads added. .
From I87 take Exit 17S. Head south on Rt 9, and within a few hundred feet bear right onto Old Saratoga Rd. Proceed about 3/4 miles. The park entrance will be on your right. Flash your white hair at the ticket window (New York State resident 62 or older get free vehicle entry on non-holiday weekdays) and use the parking area immediately on the right. Note: Rides will depart promptly at the given starting time. Leaving at 10:00 AM from Moreau State Park upper parking lot. Directions to start: From I87 take Exit 17S. Head south on Rt 9, and within a few hundred feet bear right onto Old Saratoga Rd. Proceed about 3/4 miles. The park entrance will be on your right. Flash your white hair at the ticket window (New York State resident 62 or older get free vehicle entry on non-holiday weekdays) and use the parking area immediately on the right. We'll cross the Hudson headed west, then turn south on West River Rd., following the west bank of the Hudson River. We'll then cross back over the river at Rt. 4. Then head north on a very quiet riverside road to Lock 6, Fort Miller, where we'll have lunch. We'll then continue north along the canal for a while before being forced out onto Rt. 4, which has fast moving moderate traffic, but a very wide shoulder. We can stop at Stewart's in Ft. Edwards for ice cream before returning to our cars. The route is 23 miles, and generally flat with the exception of a few hills. The route is paved except for 2-3 miles of well packed gravel. Leaving at 10:00 AM from Rodger's Island Visitor Center, Ft. Edward. Directions to start: Northway Exit 17N. Proceed north, turn right at light onto 197. Rogers Island will be on your right immediately after crossing the bridge as you approach Ft. Edward. The access to the Towpath that we will use is easily reached from the Northway and has adequate parking; therefore no additional meeting places are planned. If you have the capacity to carry additional bikes and would like to carpool with someone please feel free to send an email to arrange an additional meeting place. The Terminal Rd access point can be reached from the Northway from the south by using exit 7 to Rt. 9. Continue north on Rt. 9 for ~4.7 miles and turn R on terminal Rd immediately after crossing the Crescent Bridge. Those traveling from the north can use either exit 8A or 8. From exit 8A turn L off the ramp and continue on CR 91(Grooms Rd) for ~1.4 miles to Rt. 9. Turn R on Rt. 9 and continue south for ~1 mile and turn L on to Terminal Rd. From exit 8 turn L off the ramp and continue on Vischer Ferry Rd for ~1.75 miles to Rt. 9 – cross to Terminal Rd. This is a new route for the EZriders beginning at Shenantaha Creek Park. We will pedal south on the Zim Smith Trail to meet the new Luther Forest spur. With several miles of paved bike path we will explore Luther Forest and stop for lunch at Malta Community Park (picnic tables/pavilion, rest rooms). Reversing our route, we head back to the ZS trail and bike south to Round Lake with a stop at Leahs Cakery....delicious pastries, etc. Then north again to the start at Shenantaha Creek Park for a round trip os approx 20 mostly flat miles We will meet at 10 AM at Shenantaha Creek Park....from exit 12 of the Northway west on rt 67 for 1.5 miles...turn left on Eastline Rd....then go 1/4 mile and turn left into Shenantaha Park. We are invited to attend this Crooked Canes event. The target member is retired, active, and looking for a social/recreational biking experience. The club is informally organized; with no sponser, officers, or membership fees. Routes will typically be 18-28 miles; in Warren, Washington and Saratoga counties. Riding pace is typically 11-13 mph with periodic breaks. If you prefer a faster pace the club may not be for you. We're currently riding every Tuesday in season, weather permitting. Start times are mid-morning; with lunches packed for eating on the road. Ride leadership is shared by all. Communication is via the Internet. The size of group will be limited to reduce parking limitations and traffic interruptions. Due to its informal nature and limited size the club has no formally assigned sweeps for rides. If the group is small the leader will take responsibility for keeping the group together. However, with a group of 15 or more this can be impractical. To address this problem there are cue sheets available for most rides. When a cue sheet is available, it is the rider's responsibility to print out and carry the sheet. There are a number of techniques for carrying a cue sheet on your bicycle. Put it away for emergency use and keep the leader in sight. Use a handle bar bag with a "window" on the top. Buy a specially designed inexpensive clip to attach it to your handle bar. Search Amazon or eBay for "cue map clip". For a free solution attach the sheet to your brake or shifter cables with a clothes pin, binder clip, or tape. For a more elaborate approach use velcro tabs with adhesive backing: male velcro goes on top of your stem, female velcro goes onto the back of a ZipLock plastic bag. Put the folded cuesheet into the ZipLock bag and stick to your stem. The club is currently accepting new members. If the club charter matches your interests, add yourself to our list by clicking on the Membership List button above. As a member, it is hoped that you will contribute one or more rides to our catalog. To add to the catalog, click on the Ride Catalog button above. If you have a friend that wants to participate, but doesn't have Internet access, you may add the person to the membership list (with no email address) as long as you are willing to keep your friend posted by phone on the latest ride information. On some of our bike routes the only bathroom facilities may be "in the woods", which puts women in the group at a disadvantage. Fortunately, there are many devices on the market to address the situation. Here is one. If you are interested in both casual and serious biking in southern Washington County, Cambridge Valley Cycling will be of interest. Send any ideas or comments to Dave King.